Sgt. 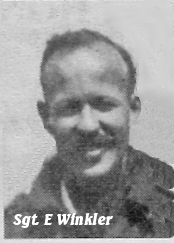 Eric Winkler was to become one of the original 419 squadron airmen. August 1940 was still a fledgling time for the RCAF and the plans being put in place for aircrew training when Eric Winkler travelled from his home town of Hanover Ontario to enlist down south in the city of Toronto. Aircrew volunteers swamped the recruiting stations across the country and the offices in Toronto were no different. The months that would follow his enlistment were full of the usual postings to Manning Depots and various training bases set up throughout the country and his home province. By 1941 he had completed his courses and received his Wireless Operator/ Gunners wings. Still in his early twenties he would be posted to even more training upon arrival in Britain , where he travelled north to Scotland and began a course at RAF Lossiemouth. The base was set up to bring the different trades that made up a bomber crew together in to a team. (RAF Lossiemouth would later be the base for the “Dam Busters” squadron, which it still is today.) At this point in the war the training path for Bomber Command aircrews was not as long or developed as it later become. December of 1941 was the month No. 419 squadron RCAF was just being formed, with no aircraft, and only 22 air crew and 204 ground crew posted to Mildenhall based squadron. Over the next few months the aircraft and air crews would arrive, then it would be up to the weather to start to cooperate. For Sgt. Winkler as with many of the squadron members it would be a time of mostly cancelled operations, replaced by even more training. The squadron log book shows numerous cancellations based on the winter weather which must have been a frustrating time for all. In time Sgt. Winkler was crewed up with F/S Charles LeBlanc, P/O John Watson, Sgt. Norman Bradley and Sgt. Joseph Angers. Operations they flew were not always to go without incident. Wellington number X3359 was to endanger the crew on one of their first operations. The aircraft’s starboard engine began to overheat and the bomb load had to be jettisoned to lighten the load so Sgt. LeBlanc could bring the crew home safely. Of all the targets they were assigned, it would be Essen which would continue to bring them into danger on more than one occasion. On June 8th the bomb load was delivered to Essen, all except ninety of the four pound incendiaries which became hung up in the bomb racks and could not be shook free. So Sgt. Winkler sat at his Wireless position barely feet from a lethal bomb load still hanging by their own entanglement in the bomb ranks. Most likely with the bomb doors open just in case. If indeed the bomb doors remained open during the return flight their progress home would be slower and would make the Wellington and crew an easy target for roaming night fighters. It would be one week later on what would be Winkler’s third mission to Essen within a span of sixteen days, and the very next mission after the hung up incendiaries, that the crew would find themselves on the way again to Essen. Winkler and crew were aboard X3359, the aircraft used by the crew on all but one operation. And again, as on the operation to Cologne when the starboard engine problem had developed, they were dealing with another mechanical problem in the starboard engine. This time there would be no turning back. Already over enemy territory and the heavy vibrations of the propeller damaging the engine to the point where it had to shut down. All the while the aircraft had been drifting over into a more heavily defened area . With the power of only one engine and the Wellington as the lone target in the sky, X3359 was caught with all guns and search lights aiming at it. The pilot, Sgt. Leblanc called for crew to bail out, and Sgt. Winkler and the other crew members jumped to safety. The young pilot F/S Charles Leblanc stayed at the controls to enable his crew to safely escape, he himself was unable to escape the aircraft. For Sgt. Eric Winkler , after thirteen operations, he would now be a Prisoner of War for three years. Imprisoned at Stalg Luft III, it would not be until June of 1945 before he would be liberated and eventually return home to Canada. Back home in Hanover he moved on from the business world to the world of politics. Serving for 10 years as Member of Parliament and also eight years as MPP. In 1989, Eric Winkler would find himself again involved with the 419 Moose Squadron in an emotionally charged event, as he and many other veterans of the old squadron were part of a Colour Parade at the base in Cold Lake Alberta, home to the new 419 squadron.